On Sunday, The Attleboro Sun Chronicle posted an editorial about the ‘perks’ many of our college-level administrators and teachers receive. As more money becomes available for student loans, colleges have no reason to cut their costs or seriously consider how they spend their money. The Sun Chronicle pointed out some of the things currently impacting the cost of a college education. Massachusetts state university costs students around $9,000 a year, or 24 percent less than the average New England private university. But that could be changing, putting the economic future of many Massachusetts citizens – and the fiscal future of the state as a whole – in jeopardy. As an example, at Bridgewater State University, which draws scores of undergraduates from the local area, students face a potential $700 increase in student fees next fall, the largest hike since 2007. Bridgewater State’s board of trustees is already projecting a 4 percent reduction in department budgets alongside the increase in fees, as Sun Chronicle correspondent Kayla Canne noted in an April 9 story. Since 2007, the state’s Department of Higher Education says, tuition and fees at Bridgewater gradually increased from $5,866 to $8,928. Part of this is due to the failure of the Legislature to fully fund the state’s higher education budget, particularly the $8 million in union contracts that universities have negotiated with faculty and staff. But it also makes it all the harder to justify the perks of office handed out to top university administrators. Dana Mohler-Faria, Bridgewater’s ex-president, cashed in his unused sick and vacation time for a one-time payment of $269,984, accepted a $183,421 annual pension in addition to an annual $100,000 consulting contract with the school. (Mohler-Faria eventually gave up the consulting contract after facing criticism.) His perks were hardly unique, however. A recent story in The Sun Chronicle by the New England Center for Investigative Reporting revealed that presidents and other top administrators at public colleges and universities are provided houses, cars, free tuition for their spouses and children, country club dues and other perks. Some are eligible for bonuses of up to $201,000 per year. Might some of this be responsible for the high cost of a college education? When you consider that the government took over the student loan program during the Obama Administration, leaving the taxpayers on the hook for defaults on college loans, the cost of a college education becomes important to everyone. It’s time for colleges to look at their budgets and consider how they are spending their money. 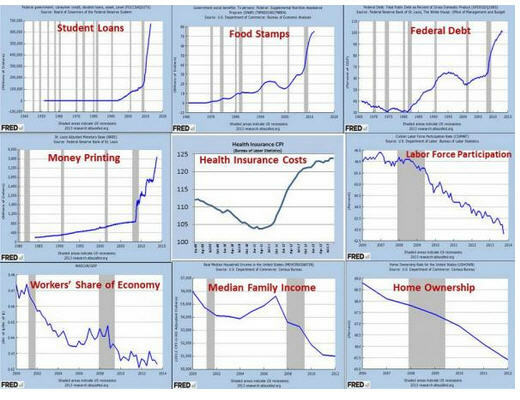 Zero Hedge has posted nine charts that clearly show what President Obama’s economic policies have done to the American economy and those of us who try to exist in it. If you follow the link above to the site, you can make the charts larger. It really is not a pretty picture. The Wall Street Journal has two stories in its opinion section about what is happening to student loans–the first is entitled, “Your Taxpayer Tuition Bill,” and the second is entitled, “The Hidden Student-Debt Bomb.” As you know, the federal government took over the student-loan market in 2010. The Department of Education now stands behind over $1 trillion in outstanding debt. Less well known is how the same federal government that has promoted and subsidized this debt is also scheming to make sure it doesn’t have to be repaid. Jason Delisle of the New America Foundation has the story in a nearby op-ed. Even as the debt-level rises and the economy improves, the feds are promoting loan forbearance and forgiveness programs. The first article explains that graduates who choose nonprofit or government jobs an have their loans forgiven entirely after 10 years. Two years ago the Administration’s estimate of the average amount to be forgiven in income-based repayment plans was already $41,000 per borrower. The total amount of forbearance loans is $125 billion, and rising. And even with all of these ways to avoid on-time repayment, borrowers are still defaulting at a rate of nearly 20%. The clear danger is that hundreds of billions of dollars will never be repaid, which means that future taxpayers will have to pick up the tab. Now on to the second article. The problem with the government taking over student loans is that a large percentage of them will not be repaid–leaving the taxpayers to pay the bill. Conveniently, the bill will be due after President Obama leaves office. Despite more borrowers taking advantage of benefits to suspend and lower their payments, the share of borrowers in default is still trending upward. It now stands at 19.8% of borrowers whose loans have come due—some 7.1 million borrowers with $103 billion in outstanding balances. That’s the highest share since the Education Department began making the statistic available in 2013, and given other trends, it probably is a record high. These trends are troubling because the U.S. economy has been improving for some time. Yet fewer and fewer borrowers are repaying their federal student loans. For those who do make payments, more of them are paying too little to retire the debt they took on. There are some things we need to remember. Any time the government takes over something, it makes it less efficient. Banks had motivation for collecting on these loans and thus used wisdom in granting them–the government has neither. The amount of a college loan should be connected to the marketability of the skill required–borrowing more than $100,000 to get a degree in Women’s Studies does not necessarily make sense. As an aside, I once knew a person who had a Ph. D. in lute, but he was working for a living and being responsible financially. I also once worked doing data entry in a call center where one of the telemarketers had a degree in Ancient Egyptian Archeology. I asked him why he was working as a telemarketer, and he replied, “I like to eat.” An education is a wonderful thing, but at some point employment has to be a goal. Not everyone needs to go to college, and the American taxpayer does not have to pay the bill for everyone to attend.